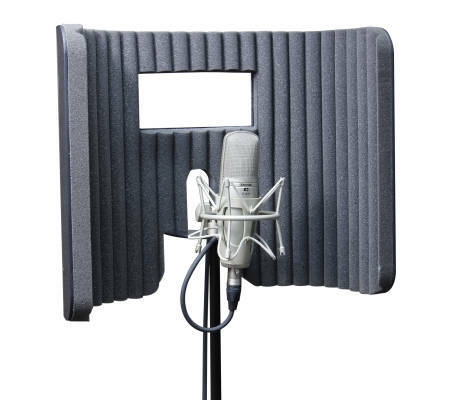 The Primacoustic VoxGuard is a portable acoustic screen designed to reduce the ambient noise around a microphone when recording. This helps to eliminate excess echo and reverb, allowing the engineer to reintroduce the desired effects during mixing or post-production. The VoxGuard features high-density open cell acoustic foam that provides maximum absorption throughout the vocal range. An extra large high impact ABS outer shell keeps unwanted noise out, while innovative slotted ports prevent excess bass buildup and resonance commonly associated with stand-mounted absorbers. Once mounted, a rear access cable port allows any hand held or studio microphone to be articulated and directed at a specific source. The VoxGuard has been updated for 2015 and now features a window that allows the vocalist to maintain visual communication between the engineer, producer or other band members. Unlike other similar offerings that employ heavy and cumbersome steel parts, the VoxGuard is lightweight and easy to use. The outer shell simply slides over the threads of the microphone stand and is held in place by the clip, shock mount, or included threaded adapters. For additional flexibility, an extension bar is included for infinite mic placement possibilities. The lightweight design and simple mounting hardware makes positioning the VoxGuard easy without the usual fear of the stand falling over and damaging the microphone. Thanks to its simple and lightweight design, the VoxGuard can also be used as a portable acoustic gobo in front of amplifiers, acoustic instruments, or anywhere that basic isolation is required. This makes it and ideal tool for recording studios, film and television, pod casting, and mobile recording. *Stand and mic sold separately.